Alice Isn’t Dead (2018. 322 pages) is a supernatural thriller from Joseph Fink. 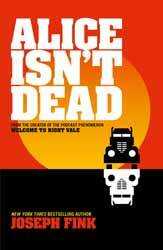 The book was inspired by Fink’s podcast, of the same name, part of the Welcome to Night Vale podcast (NightValePresents.com). In an effort to cover as much ground as possible Keisha gets her truck driver's licence and gets a job hauling goods all across the States. On one particularly dark night, she witnesses a man being killed and eaten by a creature that is not quite a man. From then on the creature starts to stalk her. It’s a very American novel, providing a landscape that is large enough that secrets and horrors can exist on those long and lonely stretches of road that join the relative safety of the cities. When Keisha first witnesses the murder, she thinks that it a single serial killer, but can find no one who wants to know. Afraid that Alice may have succumbed to this killer, Keisha goes on the hunt. Along the way she discovers the truth about the strange creature and gains an ally. She also learns about creatures that no longer live a linear life. To say more would be to spoil the book. As a character, Keisha is not what you would expect from a hero. She is anxious and afraid most of the time and in flashbacks we discover that Alice shared this trait. Whereas Alice would externalise her anxieties, making her want to help the world, Keisha’s are totally internalised. It is this internalised energy which she learns to channel, allowing her to become occasionally extremely violent, when violence is the only way to save her life. The book offers up a satisfying blend of romance, horror and suspense. I do think that the first half of the novel lacked enough pace while the author was world building, but it’s understandable as there were a lot of pieces and concepts to be introduced before the story kicked into a more action orientated mode. It was interesting to spend some time in a world were all conspiracy stories are true, which makes it a disconcertingly terrifying place and satisfying that the book does answer the question as to whether Alice is dead or not.